My most painful moment as a City Councilman was watching two mothers of slain sons meet earlier this month at a Unity Rally. By all accounts, their children were superb young men. Neither one had ever been in trouble. They looked forward to bright futures. The two mothers – one black and one white – embraced and wept. I cried, too. The killings in our city are demoralizing. Families and entire communities have been ripped apart by bullets. It feels like we are all living in a thick fog of fear, stress and grief. Last week, Mayor Catherine Pugh introduced legislation to impose a mandatory minimum of one year in jail for anyone caught with an illegal gun within 100 yards of a school, park, church, public building or other public place of assembly in Baltimore. Many citizens (myself included) share his frustration. I am grateful to Mayor Pugh for taking a stand. But as elected officials, we are obligated to carefully consider all of the consequences and context of this legislation before casting our vote. As the victim of a gun crime, I bring a unique perspective. A few years ago I was robbed at gun point in my home. The assailant broke a window downstairs, opened the front door, and walked into my bedroom where I was working on a paper for grad school. After pointing his handgun at my head, he took my wallet, phone and laptop. I blanked out and can’t remember what happened next. I spent the next year living in fear and suffering from mild depression and anxiety. The experience made me deeply empathetic to victims of violence. Over the past week, I have listened to mothers of victims, police officers, colleagues, community members, public health practitioners, activists, anti-violence advocates and academics. I have attempted to read up on the criminological research and explore similar case studies. The evidence supporting mandatory gun sentences as a crime-fighting tool is murky. In 1975, legislators in Massachusetts enacted the Bartley-Fox Law that imposed a one-year mandatory minimum sentence for gun possession along with additional sentence enhancements. Subsequent studies on its impact were mixed, with no clear indication that the law significantly reduced violent crimes. On the whole, mandatory minimum sentences have not been proven to deter crime, but have had a catastrophic impact on individuals and communities. A comprehensive study by researchers at the Brennan Center for Justice looked at the effects of “tough on crime” policies like mandatory minimums and “Three Strikes Laws.” The researchers found that drastically increasing our prison population between the 1980s and 2015 did not make Americans more safe. Programs that improve economic opportunities, modernize policing practices, and expand treatment and rehabilitation can all be better public safety investments, the study concluded. The term, mandatory minimums, evokes powerful cultural memory. It is a remnant of the “zero tolerance” policing era, when politicians from both parties tripped over each other to appear toughest on crime. Instead of viewing drug addiction and violence as public health crises, elected leaders reached for increasingly draconian tactics and sentences. These policies alienated the police from communities of color. They led to a culture of mistrust in which witnesses to truly heinous crimes were afraid to come forward. Recidivism loomed large for people unable to find work after a felony conviction. PUBLIC HEARING: At 10 a.m. tomorrow (Tuesday), the City Council’s Judiciary Committee will hold a hearing on Bill 17-0111, Mandatory One-Year Sentencing for Illegal Gun Possession, in the Council chambers at City Hall. Some of the arrests for crimes like “loitering,” “public intoxication” or “possession of an ounce of marijuana” would be laughable on most college campuses, yet held life-altering consequences for citizens of Baltimore. Advocates argue that mandatory sentencing is a focused approach that targets the few, truly destructive members of our society. It is about removing “bad guys with guns” that wreak havoc on our city. But here’s the problem: We know that the vast preponderance of violence is committed by a small handful of repeat offenders. This group of truly dangerous people have thus far eluded justice. They rob and kill without compassion or fear of consequences. It is not clear how the addition of a one-year mandatory sentence would deter these offenders from committing assault, robbery or murder. While the evidence for this legislation is shaky, one Baltimore-based program has shown remarkable results. 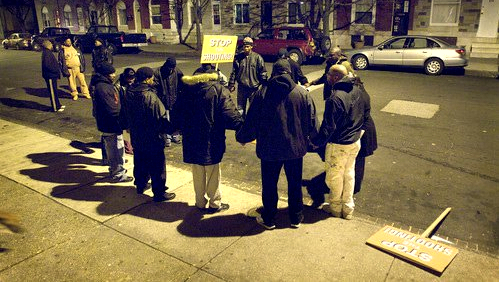 Safe Streets takes an epidemiological and community-based approach to curbing violence. The program employs ex-offenders to mediate conflicts before they become deadly. To catch the people committing the vast majority of violent crimes, witnesses must not feel scared to testify. Right now, there is ample evidence that Baltimore’s Witness Protection Program fails to keep vulnerable people safe. We have have had several high-profile cases of witnesses being threatened, harmed and even murdered before providing testimony. This enables violent criminals to rob and kill with impunity because they do not fear prosecution. As alternatives to a mandatory gun law, I propose that Mayor Pugh expand Safe Streets and take a comprehensive approach to helping the sheriff’s office and the state’s attorney retool witness protection. In the last budget cycle, the mayor and City Council invested $1.5 million in Safe Streets. Let’s double that amount to $3 million in fiscal 2018. And let’s fix the dysfunctional witness protection program, providing additional resources where needed while enlisting support from state and federal partners. Such an approach recognizes the need to hold people accountable, while also investing in what we know works. I appreciate the thoughtful work of state legislators who are pushing for other comprehensive solutions to this crisis. Until we address the root causes of violence, we will continue to struggle. The legacy of segregation, concentrated poverty and lead-paint poisoning continue to haunt this city. For Baltimore to move forward, we must focus on addressing these issues like a laser. The best solutions to disrupting violence, like Safe Streets and enhanced witness protection, will come from within our communities. I look forward to a day when no mother will have to experience the loss of a child to violence. We are in this together. Zeke Cohen represents the southeast’s 1st District in the City Council.